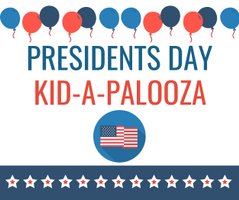 Presidents Day Kid-a-Palooza is a day camp for children who are in Kindergarten to 6th grade. This day camp will be held February 18th, 8:00am-5:00pm, with drop-off starting at 7:30 am and pick up starting at 4:45pm. During this time, campers will get to experience EKU Campus Recreation and its many activities. Activities include but are not limited to meeting EKU’s president, indoor and outdoor games/sports, arts and crafts, group fitness classes, educational sessions and lots of fun! !